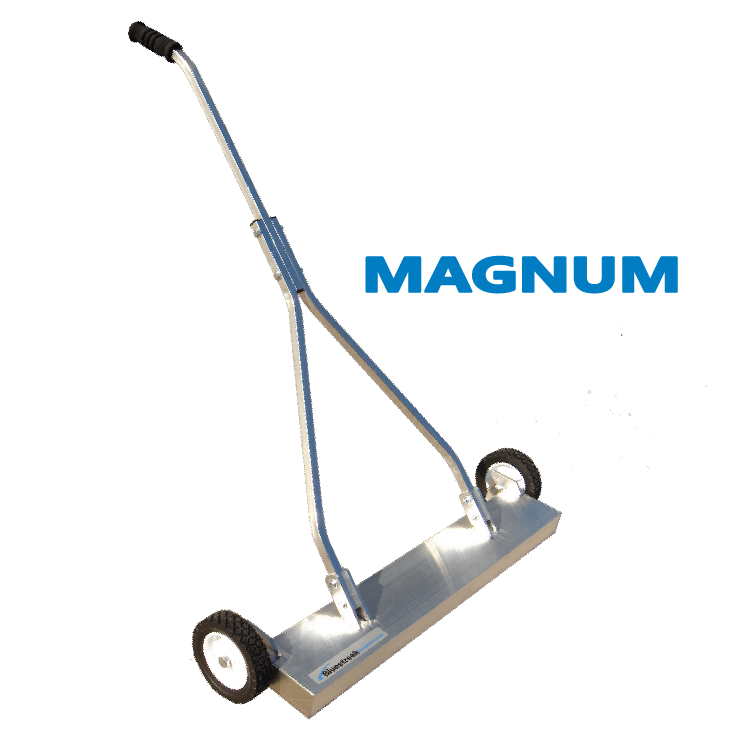 The Magnum was originally designed for the price conscious roofing market looking for durability and performance. Therefore it has a welded design, double welded lower handle support brackets, a three piece “Y” type handle for extra durability, and good commercial level pickup power, with a medium weight to allow easy loading and unloading from job site to job site. The Magnum also features the “Wrap Around” design so that it holds onto nails or any other debris even if the nails that were picked up are pushed backward on the bottom of the sweeper by grass. The nails won’t fall off in this case, they just “wrap around” and snap onto the back side of the magnet. “Wrap Around” feature holds onto nails and debris even if grass tries to wipe it off. 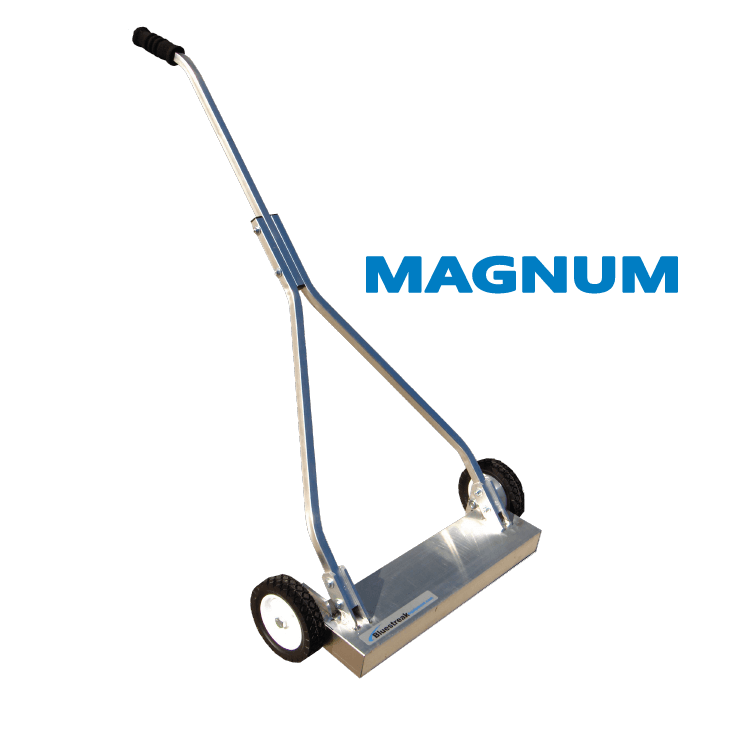 With double the amount of magnets than the Scape Series™, the Magnum Series™ sweeper packs a lot of pickup power for an entry level professional sweeper. Packs a lot of pickup power in a entry level professional sweeper.
" Product was very easy to assemble, less than 5 minutes. We have only used it in one area this morning, but it has cut down on cleaning up time by at least 50%. Great Product. Thanks." 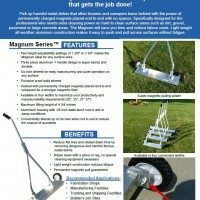 Since the Magnum was originally designed for the price conscious roofing market it was constructed to be durable as well as have pickup power. You’ll notice the stability and strength in features such as the welded design and the double welded lower handle support brackets. The three piece “Y” type handle adds extra durability and stability. 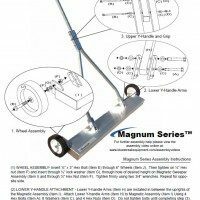 The solid construction is combined with a medium sweeper weight to make loading and unloading the magnet from job site to job site easy. 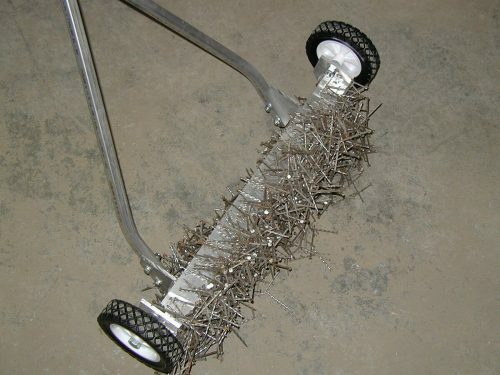 The performance is shown in the power of the magnets to pickup metal and the “Wrap Around” feature that prevents nails from being pushed off the sweeper’s back side when pushing it through grass. 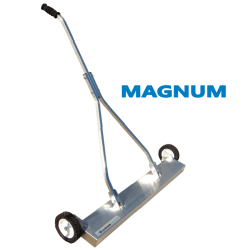 The Magnum is designed with two settings to adjust the sweeping height, 1 3/8″ and 2 3/8″. Height adjustment allows fine tuning of performance on a variety of terrains and conditions for optimum performance. The feature you’ll use the most, the handle, was specifically made with three pieces to give the handle sturdiness and durability and it also contributes to the tight feel of the sweeper unlike many single piece handle designs on the market. The welded design also adds extra durability and long life. Available in 4 sweeping widths, 20″, 25″ 31″ and 37″. Wheeled construction makes it easy to push across surfaces without fatigue. Rugged three piece “Y” handle design for sturdiness and durability. Maximum lifting height – 4 ¾” (using a two and a half inch nail). Wrap around feature for performance in grass. Cleaning Method Wipe clean with glove or rag. Wipe clean with glove or rag. Wipe clean with glove or rag. Wipe clean with glove or rag. The sweep arrived. Wow, the packaging was over the top. Assembly was easy. Because I’m tall, I need to move the wheels to the bottom brackets to gain a bit of height. Would be nice to have a selection of lengths for the handle so the handle could adjust for different stature people. See, I’m 6’7″ so with the wheel on the top bracket keeping the magnet closest to the ground, I stoop just a little when pushing this sweep. That said, the sweep works great. I think it is the best available. Thanks. Great service. Kept me posted on when it was shipped and gave tracking number. Product was very easy to assemble, less than 5 minutes. We have only used it in one area this morning, but it has cut down on cleaning up time by at least 50%. Great Product. Thanks. It did arrive and it works amazing. Much better then the rentals I previously used. Thanks again for the quick turnover. We received the sweeper yesterday. I put it together in just a few minutes and used it right away. I could hardly believe all that was picked up. I am very happy with the unit and believe it will prevent many flat tires in our operation. We may in the future be interested in more items from your company. Thanks.